Posted 4/4/2019 10:01am by Kinley Coulter. April at Coulter Farms often arrives cloaked in deception. Warm sun seems to offer an early spring, but cold nights and blustery days wipe out much of the sun's warmth. 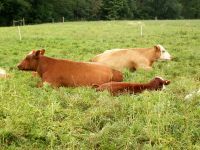 The grass is brilliant green, luring the cattle out from the barns to attempt to graze the luscious, nutritive and healing fruits of photosynthesis... but, alas, all there is in the chilly pastures is green, with no grass. So, we grass farmers begin a long 4 weeks of waiting for warm sun and green pastures to turn into significant amounts of grass that can support our cattle and sheep's needs. We have already bought into this 'April Fools' promise of imminent lush pastures, and put the animals out too soon... it doesn't work well. 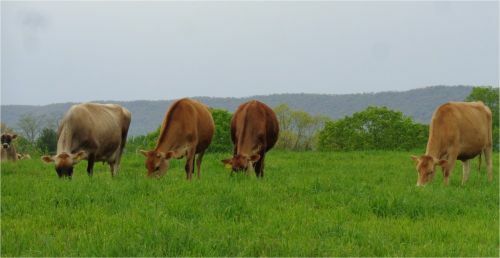 After a week of cattle attempting to graze grass that is too short and too immature to produce milk, the green is gone from the pastures, and the animals are sick from trying to eat grass that is too high in protein and moisture, and too low in sugars and fats. The cattle have no sense of humor about getting put back in the barns after a week out on sunny pastures. Overall... everyone loses when we jump the gun. We used to run greenhouses here at the farm and our neighbors had the same problem with desperately wanting to plant their gardens too early. They would come to buy our greenhouse plants, and ask us (4 weeks too early), 'is it too early to plant our garden?' We would warn them that it's way too early, but they would still buy flats and flats of peppers and tomatoes and annual flowers... only to see them frosted and withered a few days later. Oh well, at least we got to sell them a bunch more plants! 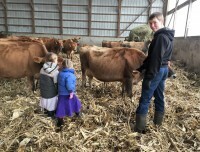 One thing we CAN do in early April is get this year's fertility onto the pastures and hay fields. 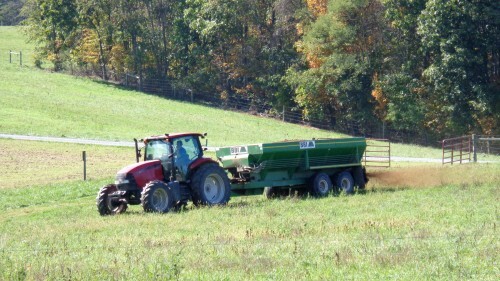 We spread chicken manure on our fields for its vital and abundant fertility. 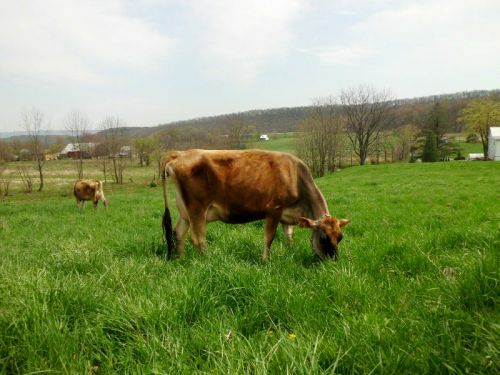 It helps us produce lush and nutrient dense grass that our dairy and meat animals need to thrive without any grain in their diet. It also helps our grasses remain green and vibrantly growing through summer's dry spells that would otherwise turn grass brown and dormant. 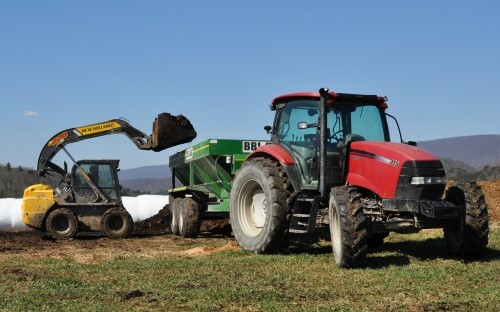 Sadly, the next photo shows what needs to be done when the apron chain, in the bottom of the spreader, breaks... it takes a lot longer to unload a spreader with shovels than it does to fill it with a skid-loader. At least Jason found a sympathetic friend (brother Jacob) to help. We also welcomed a new granddaughter, Avriel Irene, shown here with proud Daddy Jared, and our 4 year old daughter, Aunt Meagan.